I spoke to some of the DOPs I know for feedback on past, present and future experience and information which may be useful to other users out there. Chris has been busy amongst other things shooting several series of 'You live in What?' for an American TV network, taking his Polecam around the world and shooting on location the weird and wonderful dwellings that people have created. He says "I upgraded from my Toshiba HD minicam to the Canon C300 as soon as it came out. I've been using it constantly, getting excellent results on and off my rig. 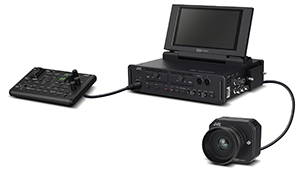 However I want to be 4K capable, so I have set my sights on the new JVC GW SP-100E minicam. I'm just waiting now for it to become available." The camera features a 4K/2K remote camera head and a recording/playback unit with built-in detachable full HD 7"monitor and an RCU controller. 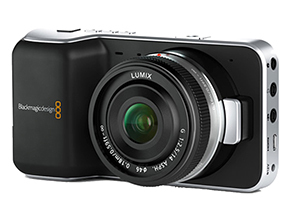 It produces 4K video, with 3840x2160 resolution at up to 50/60p recorded locally to SDXC UHS-I U3 memory cards. It has an interchangeable MFT lens mount with a shallow flange depth, which offers the greatest flexibility to end users already owning lenses. The mini 4K camera can also be attached to a gimbal option which may be used with a helicopter system, with anti-shake and anti-blur technology. John has been a champion of Toshiba minicams back from when he put the first SD version on his early Polecam. He stayed with the HD version of it (IK- HD1) on his rig when others were changing to larger cameras like the canon C300. "I stayed with the Toshiba HD for a reason. With experience the Polecam effectively becomes part of you, and you know you can fly the camera to precisely where you want, to show what you want, with the dynamics you want to give to it. You can still do it with a larger camera but there's a subtle difference and personally I prefer the dynamics of using the small camera. It does depend on the job of course and I will use other cameras for other jobs." "Lately for some jobs I've also been using the Black Magic Design Pocket Cinema camera on my rig. It produces 1080p and I've been very pleased with the results, as have my clients." "What's happened now of great significance is that Fujinon have brought out a couple of new megapixel lenses including a C-mount 17x zoom that I have just bought from Polecam Systems. I couldn't believe what a difference it made to suddenly see the resolution I had been filtering out with the previous lenses I'd been using. It's given my Toshiba HD minicam a totally new lease of life. The wide end of the range is 4.5mm, just right for Polecam, so I'm going to be using this combination on my rig a lot. The Zif controller that the Polecam guys have put together works really well. I'll definitely be using it on the Cliff Diving series I'm shooting through the course of this year." "I am also looking at going 4K with the new JVC GW SP100E camera when it arrives to complete the range of cameras I have to offer." "I'm currently working as DOP in Morocco shooting a TV feature . I'm using a Canon DSLR 5D MkIII with lenses 16/35, 24/70 and 70/200. I'm also using the 5D on my Polecam with the 24/70 zoom lens. When I shoot in France on broadcast production, I use 2 kinds of cameras on and off my rig: the Panasonic Camcorder HPX255 and the Sony HDC-P1 with a wide angle zoom lens." Someone who knows more than most about minicams, as the designer of Polecam: "The minicam arena has got really exciting with the launch of the two new Toshiba cameras. First we have the IK-HD5, a 3 MOS chip camera which has only been out a short while but they have been literally flying out the door here for in-car use coupled with the new Fujinon TA4-XA-1 full HD 4mm lens. 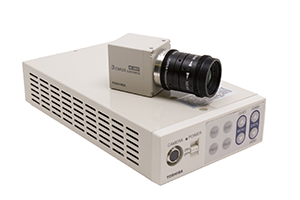 This combination produces stunning quality full 1080P pictures." "Then at the top end we have the new Toshiba IK-4K, the world's smallest 3 chip UltraHD 4K video camera providing 8Mp 3842x2160 output and showing extraordinary detail up to 1600 TV lines resolution." "As if that wasn't enough now we have a high speed minicam, the Antelope PICO that will produce HD Ultra Motion - up to 350 fps. It's an amazing small camera that will get wonderful slow motion images from places and viewpoints that has not been possible before. It mounts easily on Polecam and will also fit in our underwater housing to shoot over and under water. It's already been used for swimming and diving analysis and sports coverage, and for F1 Pit Stop analysis too. We stock all these new cameras and can advise on all technical and practical issues." Stuart says "For some time now in addition to using the Toshiba HD minicam, for a more filmic look I have I have been using either the Nikon D600 DSLR or the Canon C300 on and off my Polecam, and with the ability to suit the camera to the job, the results have been really great. Now with the pressure increasing to be 4K capable I have bought the new Sony FS7 which I use in conjunction with the Carl Zeiss ZF2 prime lenses carried over from the Nikon D600. It's around the same size as the C300 so it mounts fine on the rig but with the addition of the 4K capability and slow-mo at up to 180fps in HD. Now I'm totally covered for the foreseeable period ahead." Even though he's owned a Polecam for 12 years now he's just done his first shoot in surgery covering a heart bypass. He said "For me, this was a pretty exciting shoot. 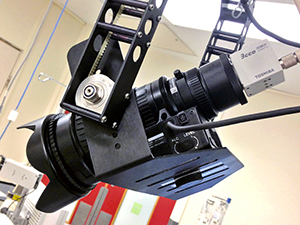 The rig had to be as compact as possible so I used two sections and the elbow connector to ensure that the rig stayed clear of the surgeons and for the same reason opted for the new Fujinon 17x zoom lens (XT17sx4.5DA-R11) with the Toshiba IK-HD1 minicam." "The Toshiba minicam looked seriously pimped up with the new Fujinon lens which was comparatively ginormous. The director was extremely impressed with the sharp imaging and this lens really did reinvent the Toshiba HD camera taking it to a whole new level." "As well as the Toshiba HD minicam I have a Canon C300 and 5D and I've just ordered the Sony FS7 so I'll have 4K capability as well as slow motion. Before when people asked to have Polecam on a shoot there was no camera choice - it had to be the Toshiba HD. With the new flexibility of the rig people can ask for a Polecam with a C300 for example, to match the other shoot cameras because that will save time with grading down the line." Tommie owns two Jimmy Jibs and two Polecams, and regularly covers top winter sporting events in Scandinavia. 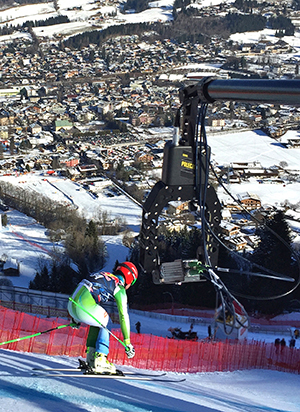 He says "For skiing events I mostly use Polecam because of the portability, rapid setup and because I can rig it right beside the start gate on the downhill ski runs and get close-in shots and angles without intruding into the skiier's space. 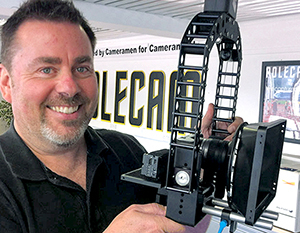 Although Polecam now takes larger cameras I have stuck to using minicams on these jobs because of the advantages of having such a low profile head." "Much of what I shoot is on multi camera OBs, and for a while the Toshiba HD minicam I used matched up to the other OB cameras well enough for everyone to be happy. But with time the OB cameras were upgraded, and I wanted my shots to match perfectly with the new cameras in resolution, colorimetry, dynamic range and all so I set about trying to achieve that." He researched and decided to go for a minicam out of Germany we don't hear too much of here, sinaCam. (pron: seenacam). It's two piece minicam, head and CCU, single 2/3" CCD C mount with adaptors for PL and B4. It will interface to Sony camera RCPs, perfect for OB use. Distributor is Pure4C in Munich. Price, from Euros 12,865 net. Tommie says "I am more than happy with the pictures I am producing. It's a great camera." Tom has used the Toshiba HD minicam since it came out but has recently purchased the Panasonic Lumix DMC-GH4, a CSC camera (Compact System camera) without a moving shutter that will take stills but also 4K video. "This is a remarkable camera and amazing value" says Tom. 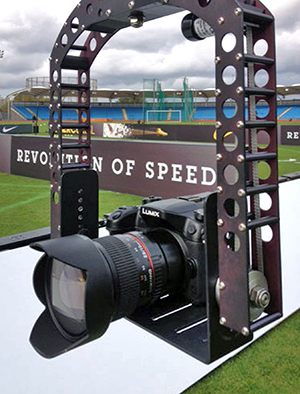 "I have used it already on my Polecam for several shoots and the video quality is superb. 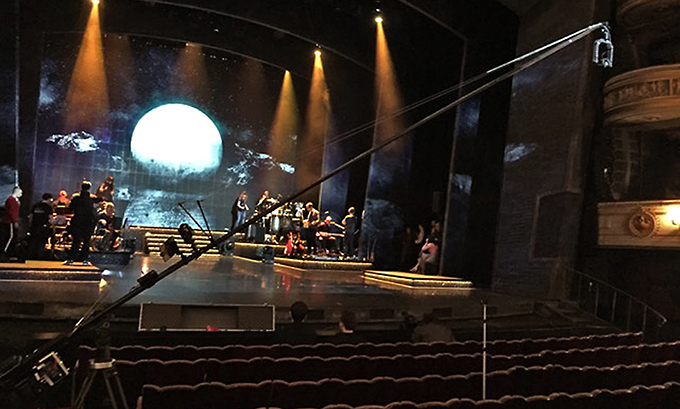 The latest was a promotion for a London West End musical where I recorded on-camera in UHD (3840x2160, 25p at 100 Mbps), and sent a down-converted SDI signal to the vision mixer via a Black Magic Design HDMI to SDI converter box." "Camera control is via the Panasonic Image App on an iPad which receives a WiFi signal from the camera and allows full control of lens and camera functions. Providing production with a 4K iso copy of my footage allows them to insert full resolution images and achieve greater manipulation in post than would be otherwise possible. The small size and weight of the camera means it punches way above its league on the end of a Polecam and gives the operator far more reach potential than a heavier camera would do."